EuChemS recognises the achievements of individual scientists and teams through the European Sustainable Chemistry Award (ESCA). The European Sustainable Chemistry Award is intended to be a prestigious scheme which will raise the profile of sustainable chemistry and be a spur to innovation and competitiveness. The ESCA was initially launched in 2010. Since 2017 the Divisions of Chemistry and the Environment (DCE) and Green and Sustainble Chemistry (DCSC) nominate the winner of the European Sustainable Chemistry Award (ESCA), that will be made public during the sessions of the corresponding biannual EuChemS Chemistry Conference. The regulation for the ESCA award can be found here. ESCA 2018 presented to Prof. Paul Dyson at the 7th EuChemS Chemistry Congress in Liverpool 29th August 2018. We congratulate Prof. Dyson as the recipient of the EuChemS 2018 European Sustainable Chemistry Award sponsored by Inkemia Chemicals. Candidates can be presented by any delegate from the Division of Chemistry and the Environment (DCE) or the Division of Green and Sustainable Chemistry (DGSC) of EuChemS. Any EuChemS member society or any EuChemS member can request the DCE or DGSC delegate of their Member Society to nominate a candidate. Prof. Paul Dyson was nominated by the Swiss Chemical Society. The ESCA award is given in recognition of 1) the lifelong research and activities carried out by the awardee, or 2) as a consequence of an outstanding specific contribution to the fields, within the remit of the DCE and DGSC. Prof. Paul Dyson has initiated and implemented many multidisciplinary initiatives in the field of green and sustainable chemistry in which he combines synthetic chemistry with physics, biology, materials science and/or engineering. Thus far he has demonstrated that he is an exemplary researcher, mentor, and teacher. Dyson’s research on catalysis encompasses homogeneous and biphasic catalysis, dispersed nanocatalysis and heterogeneous supported catalysts, with an emphasis on sustainability, avoiding toxic volatile solvents where possible, and the use of renewable feedstocks. Prof. Dyson will also present his research at the Division of Green and Sustainable Chemistry conference in Tarragona, Spain in 22-25th Sept 2018 where he is a plenary speaker. The Division Chairs Prof. Nicholas Gathergood (DGSC), Prof. Luis Santiago (DCE) and Prof. Ioannis A. Katsoyiannis (DCE) acknowledge the valuable contribution of the ESCA Awards Committee. demonstrate that chemistry and chemicals can play a central role in delivering society’s needs, while minimizing and solving environmental problems. Successful national green and sustainable chemistry award schemes have been in place for some years in several European countries and outside Europe and a recent study by the Economist Intelligence Unit points to the value of awards as demand side solutions as a key element in pushing the EU further up the global innovation rankings. The European Sustainable Chemistry Award is intended to be a prestigious scheme which will raise the profile of sustainable chemistry and be a spur to innovation and competitiveness. the design and use of chemicals and chemical products that are, for example, less environmentally harmful than current alternatives, or inherently safer with regard to hazardous concerns. The winners of the 2014 ESCA are Prof. Leitner and Prof. Klankermayer from the Institute of Technical and Macromolecular Chemistry at the RWTH Aachen University, who are being recognised for their important contribution to the field of catalytic transformation of carbon dioxide. The winner of 2012 award is Marc Taillefer, research team leader at the Institute Charles Gerhardt (IGC) in Montpellier, France. The 51 year-old chemist was honoured at the 4th EuChemS Chemistry Congress in Prague at the opening cerimony on 26 August 2012. Patrons for the 2012 award were Nobel laureates Paul Crutzen (Mainz, Germany) and Jean-Marie Lehn (Strasbourg, France). 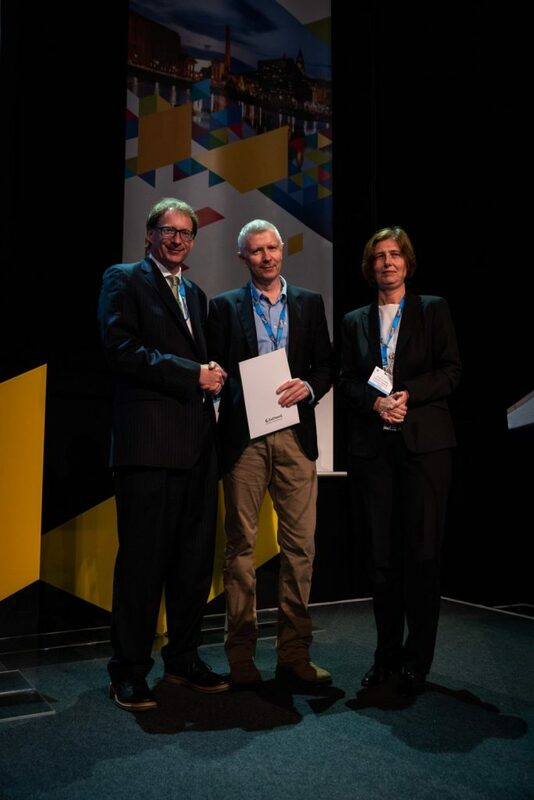 The first award was presented to Matthias Beller, Director of the Leibniz Institute for Catalysis (Rostock, Germany), on 29 August 2010 during the opening ceremony of the 3rd EuChemS Chemistry Congress in Nürnberg, Germany.